Just a reminder that if you have a Silver account, you won’t have access to free content on the the Marketplace (like demos) when they are first posted. That content will be available to Gold level exclusively for one week, after which Silver members will have access to the free content. The Fall update has a special message (above) to reflect this as well. If you have a Silver account and you see a piece of content that has a red circle with a slash through it (like the ‘Ryan Industries Plasmids and Gene Tonics’ content above) you’ll have to wait until a week after the content is released to access it. 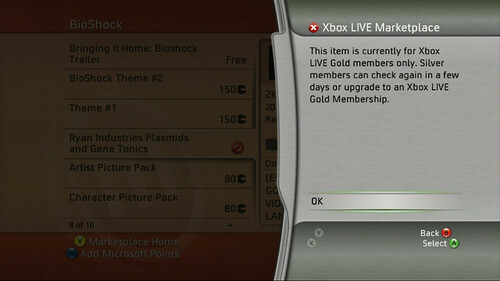 This is not done to annoy our Silver members—limited time exclusive access to content is just one of the many benefits of having a Gold Xbox Live account.